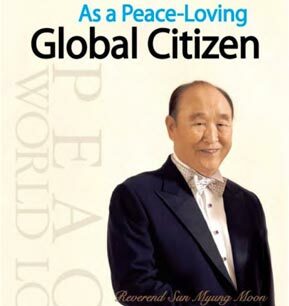 As a Peace-loving Global Citizen is the autobiography of Rev. Sun Myung Moon, the founder of the Unification Movement. It was published in 2009 in both Korean and English by Gimm-Young Publishers of Seoul, South Korea. The book was released in South Korea on March 9, 2009 and debuted at #3 on the Businesss bestseller's list. It has ranked in various bestseller lists since then and was ranked 15th on the General bestseller's list as of October 14, 2009.